Let’s face it, in a zero interest rate world, yield is hard to come by. Maybe that’s why investors have been stampeding into high yield bonds this year. We certainly aren’t complaining. The long side of our Long-Short High Yield Bond strategy Alternative Income has benefited. But there are emerging signs that it may be time to start reducing risk, and consider opportunities on the short side. The Federal Reserve announced the latest round of Quantitative Easing (QE III) last week. The consensus view is that this latest round of $85 Billion per-month bond buying will send all liquid assets higher. Investors responded by pouring fresh capital into High Yield Bonds driving prices to new highs on the year. In a climate where the Fed is promising a zero interest rate policy from now until eternity it makes sense investors have become complacent about interest rate risk. HY bond investors often look to yield spreads (the difference in yield between HY Bonds and 10Year Treasuries) as a leading indicator of risk. Tight HY spreads to treasuries have traditionally been interpreted as a low risk market, while a widening spread is an indication of increasing risk. Bond investors have been taking comfort in today’s relatively narrow HY spread. The spread has continued to tighten over the last few quarters, and remains well above the levels seen near the 2007 peak of complacency. 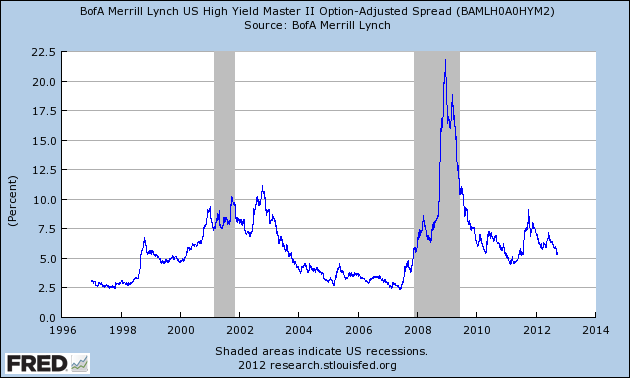 Based on spread, a perfect climate for HY bonds. The problem with risking capital based on the current HY spread is QE. These are not your father’s interest rates. Federal Bank intervention through Quantitative Easing has disrupted the natural flow of buyers and sellers, creating an artificial ceiling in 10 Year rates. A look at the absolute yield of HY bonds tells a different risk story. 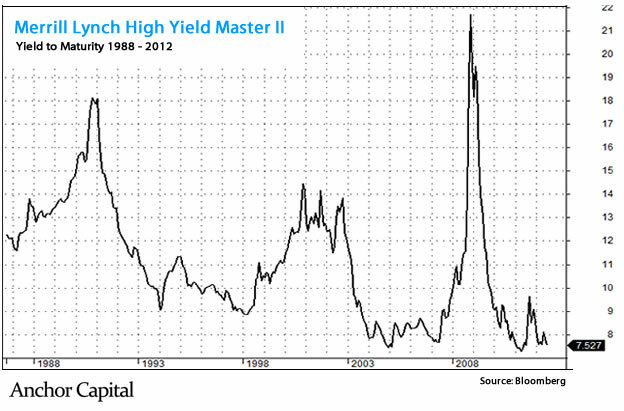 With record flows into HY bonds, prices are at all time highs, yields are near record lows. In fact current yields are at levels seen only a few times since the inception of the asset class in the 1980s, the same levels seen just before the credit crisis began in 2007. We see complacency. While many are taking comfort in the HY spread, real yields, record prices and record asset flows into HY bonds force us to ask the question: Are High Yield bond investors being compensated for their risk?. With a fresh round of Quantitative Easing underway, confidence is high that a correction simply can’t happen. Maybe that reason alone is why it can.